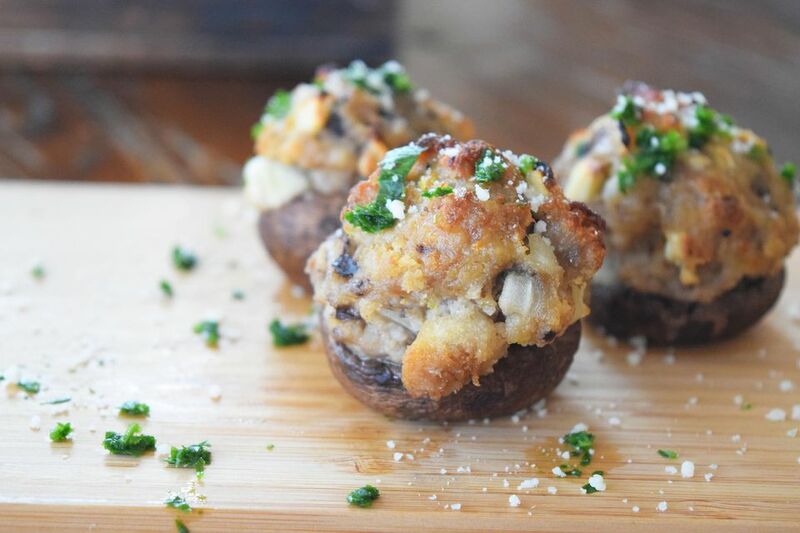 Stuffed mushrooms are such a delicious and savory appetizer! This recipe is based on Steve's mother's stuffed mushrooms. They are the best!!! She soaks the mushroom caps in marsala wine, and it is to die for. The wine makes the mushrooms so tender and extremely flavorful. But to me, the stuffing is really the best part...sausage, Pecorino cheese, bread crumbs, what's not to love? Soaking the mushrooms takes a little bit of preparation, but putting the rest of the dish together is super quick and easy. They can also be assembled ahead of time and kept in the refrigerator until you are ready to heat them up and serve! Cooking the mushrooms on a wire rack allows for the liquid to drain off a bit, so the mushrooms will not be soggy. I love serving this appetizers with my other favorite holiday appetizers, Cheesy Sausage Bread, Queso, and Sweet and Smoky Cheeseballs. These are all great appetizers for any baby shower, bridal shower, or celebratory brunch! Clean the mushrooms thoroughly and remove the stems. Set the stems aside for later. Fill a bowl or large plastic bag with the marsala wine. Add the mushroom caps and cover. Place in the refrigerator overnight, or for at least 4 hours. Chop the mushroom stems and place in a bowl. Add the breadcrumbs. Cover this mixture with the whole milk and cream cheese. Let it sit for 5 minutes. Add the grated cheese, chopped parsley, salt, pepper, garlic, onion, and garlic and onion powder. Stir to combine. Add the Italian sausage and combine thoroughly, until all of the spice/breadcrumb mixture is evenly distributed in the meat. Remove the mushroom caps from the refrigerator and take them out of the wine. Place the caps on a cooling rack over a baking sheet. This recipe makes overstuffed mushrooms, so scoop a generous amount of filling for each mushroom cap. Make a round ball of the meat mixture and place it into the cavity of the mushroom cap. Repeat with all of the mushrooms. Place the mushrooms close together on the cooling rack to prevent them from falling over. Bake for 25 minutes. The mushrooms should be golden brown. Top with a sprinkling of grated Romano cheese and chopped parsley!